The evil humans are trying to fish your friends! Save them! Defend yourself against waves of enemies using nothing but your shield! This is the type of game that can end a friendship! I played with two friends and we hated each other when we stopped. Everything is really smooth and responsive, if you find a way to add online multiplayer it could became big! I told you that I liked the idea from the beginning, and the end result is awesome! I'd love to play more, add new puzzles! I love the concept, descending in a deep alien ocean? Thrilling! What will hide at the bottom? I really like the game, it's simple yet funny to play, keep going! This is a gameplay change, now it's possible to upgrade the number of carriable fishes and the speed up tp three times. Making them more effective and valuable. 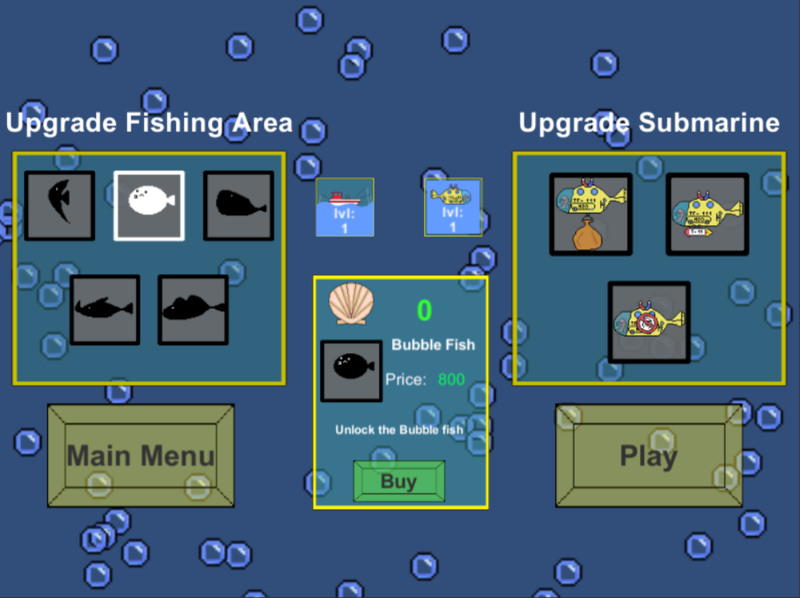 A small update this time, just to let you know that I've uploaded a new version of the game with the new things present in the 4th update, and that i've rebalanced the fishing area upgrade system. Now the shells needed to upgrade, and the consequent value of the fishes, automatically scale with the buy order. 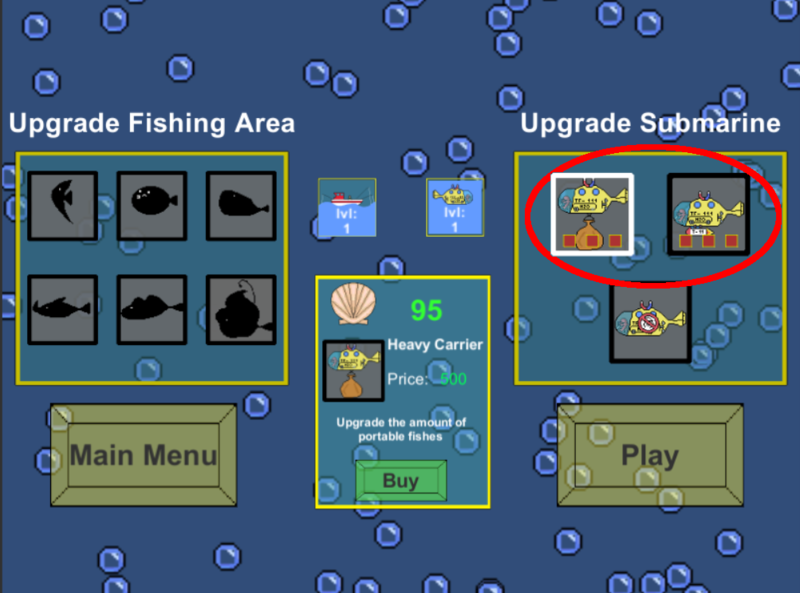 The fishes all start at the same price, in this way the player can buy the ones that finds more interesting first, and then buy the others to earn more shells. I've slowed down a bit (thanks real work), but I'm currently working on the fishpedia, it is done actually, but there's something in his look that feels off. 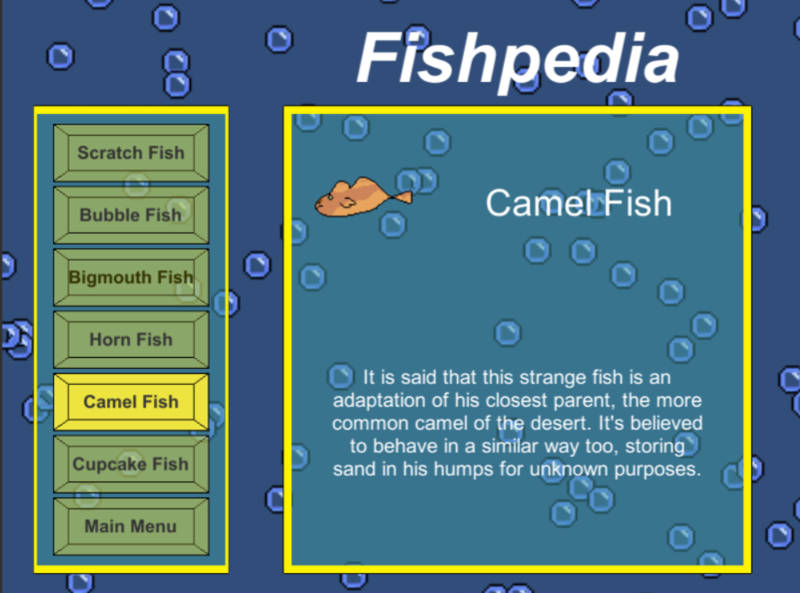 It's very simple in presentation, a small fish icon, the name and a description, maybe I could add other infos? Like size weight etc.? What do you guys think? A new fish is born! Welcome the Cupcake fish! It's still a work in progress of course but i like the idea. itch.io Community » Game Development » Devlogs · Replied to JamesDraws in Red Desert (Isometric desert survival in a vast open world) with Demo! I've played the demo and honestly I've found it fun. You are still in full development so I'm sure that the bugs and issues will be ironed out, the only thing that I want to ask is if you plan to add a sprint button. Because the distances to travel can be pretty big. But it's a solid base keep on with the good work! itch.io Community » Game Development » Devlogs · Posted in Red Desert (Isometric desert survival in a vast open world) with Demo! Hi James, the game looks really interesting. I love when games let you live your own experiences, and you pushed that button with the random generated content. Also really loving the weapons. I've tried to download the demo but it gives me an error, could you fix it? Really interested in trying it out! It's time to post the first update as I'm working slowly but steadily. 1- It's now possible to see at which level The Fishing Zone and the Submarine are, making a little easier to understand what's happening. 4- some minor improvement in the background to make it feel less fake with the add of starfishes and shells on the sand. The next target is to improve the look of the safe zone and finally add sounds and music! 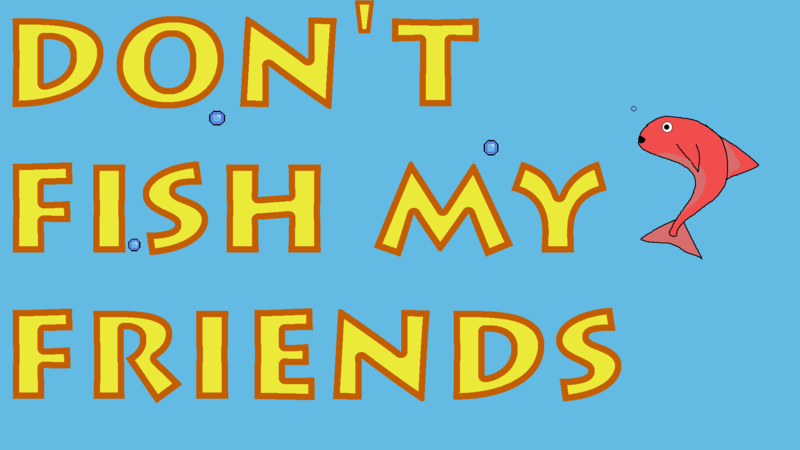 Hi everyone and welcome to the Don't Fish My Firends devlog! As some of you may already know, the game was originally built for the Fishing Jam 2 in around a week. In that week I found out that I really love to write my progress while I'm working, not only is nice to get feedback from the people interested. But also I think that having the duty to write your progress frequently really pushes you to work harder and better. And so I've decided to continue my work on DFMF because I really like the concept and the overall project so let's try to transform this fishing jam entry in a full fledged game shall we? The game idea is rather basic, Red is a really smart fish, who is really tired of watching his friends get caught by humans. He builds a submarine thanks to which he can go really fast and grab the fishes and then carry them to a safe area. 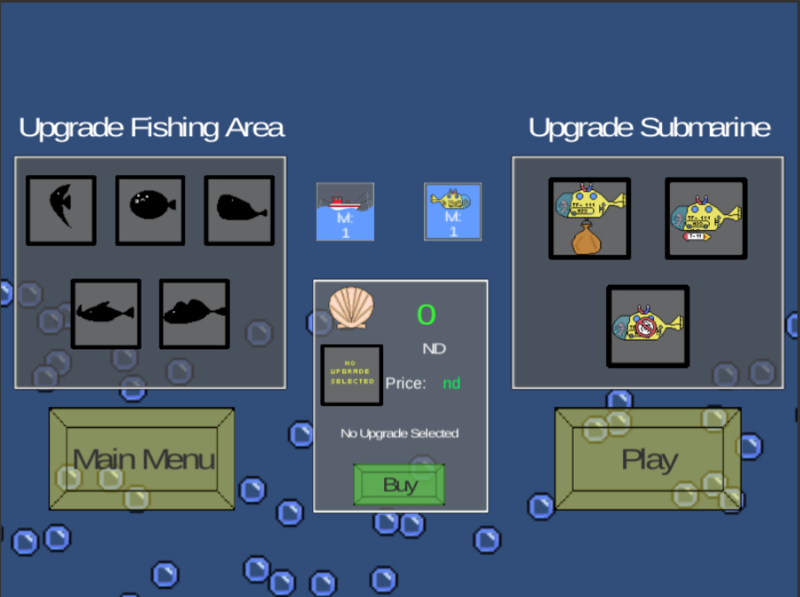 While doing so, he earns shells that he needs in order to upgrade both the submarine and the fishing area. Upgrading the fishing area means that more fishes will be attracted, and as a consequence human interest will rise and more fishermans will come, making your work more remunerative but harder at the same time. And not only that! More hazards are hidden in the ocean, you must be careful around them, but I'm sure that under the right conditions you may find them useful. This is the main concept, the game is now fully playable in browser HERE. I will update the game directly on the page and of course I will let you know in this dev blog. Thanks man I really needed help but I was so in rush that I didn't even had time to ask! But thanks a lot I appreciate it! The weeds (which I didn't implemented in the end), needed to move really slowly and floaty, but no matter what I did they always seemed snappy. What a ride! I couldn't manage myself to post one more update before the ending of the Jam, really thought I wouldn't make it to completion but in the end everything went well. Don't Fish My Friends it's my second game ever and even with all it's share of problems, I'm very proud of what it became. His journey will not end here, I want to improve it and complete it with a slower rhythm. On the 28th I was super confident, the game was a few steps to an acceptable state and I had plenty of time in front of me, and then, time flew, fast forward to the 30th at 5 pm with a lot of things to do and just hours to do everything. It was a rush, both on the keyboard and of adrenaline, a war between me and the clock. I won in the end, but many casualties occurred. First and foremost the sound effects, somehow I completely forgot of them until it was too late to implement anything. In order to being able to finish the game in time, I had to remove the hazards and my heart hurts for that. But Hey! I made it! Everything was really funny and I've really enjoyed my time while I worked on the game. Thanks everyone for the support and for participating! Thank you! Yes in fact you can carry only two fishes at time, but you can upgrade up to 4 or 5, still haven't decided. It is difficult, but you should be able to save all the fishes, now the fishes spawn at a slower rate and from more points, and the submarine is faster. Thank you! It was slower but I decided to speed up things a bit, glad you like it! It's been two prolific days from the coding side of things, the big part of the job is been done, and now I'm working to put all together and refine the details. A lot of work still remains from the artistic side, the sea bottom still needs to be done, and all the menus and UI graphics need work. But I'm confident, there's still plenty of time and because I'm free this evening I'm hoping to make some nice steps toward completion. The thing that scare me is balancing, I want the game to be hard enogh to get players engaged but not frustrate them away. I've made an addition to the gameplay, with the evolving of the fishing area new hazards will come from the depths of the sea, and not only from the humans. Nobody knows from where this fish came, but it's here now, and it's hungry for brains! You can save this fish and lose shells, or you can let it wander around and bite other fishes, the bitten fishes become zombie theirself and when you save them, they give you only one shell opposed the the normal amount. The idea is really cool, and most of all, the ideas you had for the various fishes and their effects. And I have to agree that the reel is awesome! It's so simple and so beautiful at the same time, everything blends perfectly, from the boat to the fishing line. Even the control is perfect. I really love this minimalist experiences, have you thought about a slowly moving fish? Maybe for later in the game? Fishing Jam 2 community · Posted in Fishing... For Compliments! Fishing Jam 2 community · Posted in Have no name yet, but here's a progress thread! It's awesome seeing your progresses given how detailed you are in the descriptions of the work you are doing. The game is looking really good at the moment, the oxygen bar and the checklist blend perfectly with the style of the game. I particularly like the checklist, I don't know it gives me a western vibe, like if the cormorant was a sheriff searching for the wanted fishes. Thank you! I'm trying my best to keep things closer to my skills but still trying to pull out something interesting. Today I've lost a lot of time doing the sea bed, well the seaweeds to be more precise. The Idea was to put everything in a huge sprite and animate all together. Turns out I'm not ready for such a scale so I had to take some steps back, and now I'm a little behind schedule. Oh right, seaweeds, I hate them. The problem is that I can't animate them in a satisfying way, so I kept banging my head against them in a very unproductive way. But the game is slowly coming along, I have a double upgrading system in mind, one for the player submarine and one for fishing area. 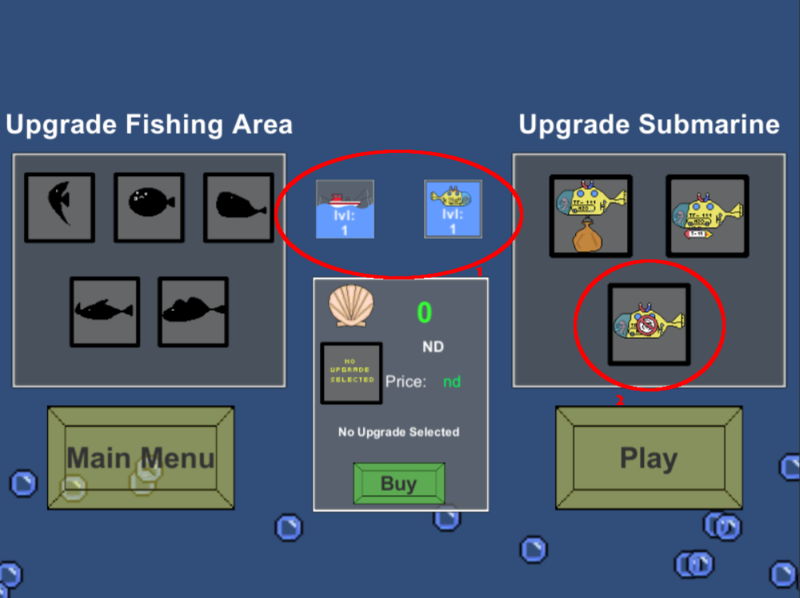 Upgrading the fishing area means that a greater number and variety of fishes will appear, allowing the player to make more points but at the same time this will attract more humans making the game harder. Meanwhile, upgrading the submarine will lower the difficulty. 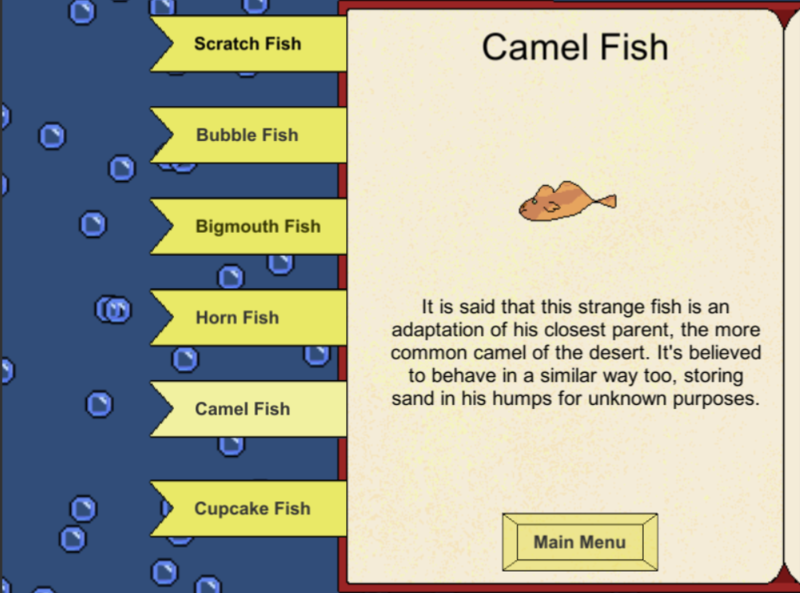 In order to do both this actions, the player must spend shells (the in-game currency), obtainable saving fishes. This is what I've put togeter right now, still unsure if the fishing day should end after a timer or after the number of fishes spawned. Good job man! The model looks really good! How much did it take to get it done? It should be quicker to do the fishes right? Hi everyone, I'm really new to game development and game jams, this is the first one in which I participate, but still I've decided to give it a shot. Never really cared about fishing games but when I saw the jam something just clicked and I had to try, so here we are. I'm working on the game from a couple of days now and I'm slowly progressing so I'll document my progression here, hoping to have something playable when the jam ends. 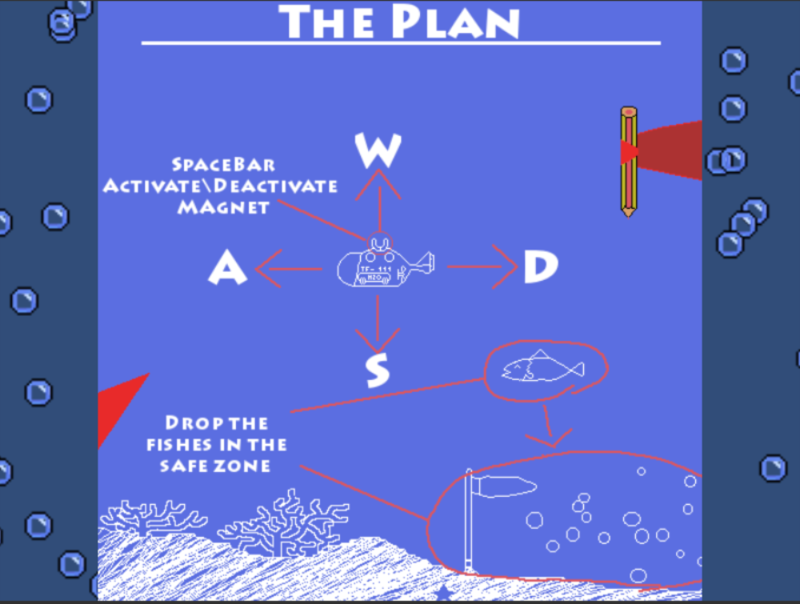 The basic Idea of the game is to put the player in the place of a smart fish that desperately wants to save his dumb friends from fall in humans hands. In order to do so he built a submarine thanks to which he can go really fast and capture his friends to take them in a safe place. Dude that's awesome looking already! Really like the fact that you are pursuing the one button philosophy, but don't stress it out. If you feel like you need more just use them. As for the palette, I like somewhat warm colors, so my favourite is in the first row, second from the right. By the way you seem very organized keep going! Awesome idea! I've never even thought of developing a fishing game but I'll participate for sure!